Incoming students at California State University, East Bay are getting more than just text books this week. The students are receiving a so-called "sound grenade" the university hopes will help keep them safe. 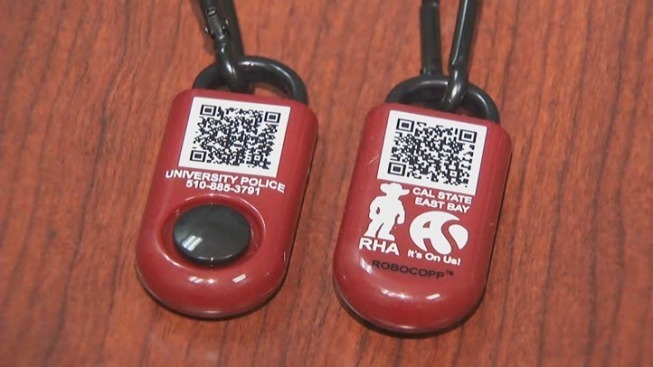 All incoming freshmen received the ROBOCOPP, a key chain-sized alarm designed to scare off any attackers. The two-inch device sounds off a noise as loud as an ambulance alarm. "We think if students feel safer they will do better academically," CSU East Bay Police Chief Sheryl Boykins said. Students welcome the added safety measure the university is implementing this school year. "I think it's a good thing," student Karla Lopez said. "You never know what could happen. This will give me protection." Students will be able to pair the devide with a campus app to pinpoint their exact location if they are ever in trouble.